One of the most iconic images of the Middle East is undoubtedly the Dome of the Rock shimmering in the setting sun of Jerusalem. Sitting atop the Haram al-Sharif, the highest point in old Jerusalem, the Dome of the Rock’s golden-color Dome and Turkish Faience tiles dominates the cityscape of Old Jerusalem and in the 7th century served as a testament to the power of the new faith of Islam. The Dome of the Rock is one of the earliest surviving buildings from the Islamic world. This remarkable building is not a mosque, as is commonly assumed and scholars still debate its original function and meaning. Between the death of the prophet Muhammad in 632 and 691/2, when the Dome of the Rock was completed, there was intermittent warfare in Arabia and Holy Land around Jerusalem. The first Arab armies who emerged from the Arabian peninsula were focused on conquering and establishing an empire—not building. 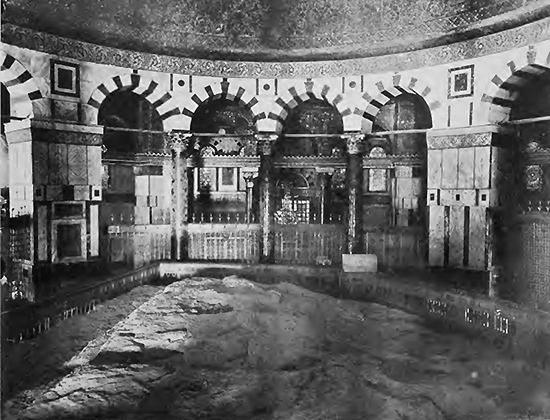 Thus, the Dome of the Rock was one of the first Islamic buildings ever constructed. It was built between 685 and 691/2 by Abd al-Malik, probably the most important Umayyad caliph, as a religious focal point for his supporters, while he was fighting a civil war against Ibn Zubayr. When Abd al-Malik began construction on the Dome of the Rock, he did not have control of the Kaaba, the holiest shrine in Islam, which is located in Mecca. The Dome is located on the Haram al-Sharif, an enormous open-air platform that now houses Al-Aqsa mosque, madrasas and several other religious buildings. Few places are as holy for Christians, Jews and Muslims as the Haram al-Sharif. It is the Temple Mount, the site of the Jewish second temple, which the Roman Emperor Titus destroyed in 70 C.E. while subduing the Jewish revolt; a Roman temple was later built on the site. The Temple Mount was abandoned in Late Antiquity. At the center of the Dome of the Rock sits a large rock, which is believed to be the location where Abraham was prepared to sacrifice his son Ismail (Isaac in the Judeo/Christian tradition). Today, Muslims believe that the Rock commemorates the night journey of Muhammad. One night the Angel Gabriel came to Muhammad while he slept near the Kaaba in Mecca and took him to al-Masjid al-Aqsa (the farthest mosque) in Jerusalem. From the Rock, Muhammad journeyed to heaven, where he met other prophets, such as Moses and Christ, witnessed paradise and hell and finally saw God enthroned and circumambulated by angels. 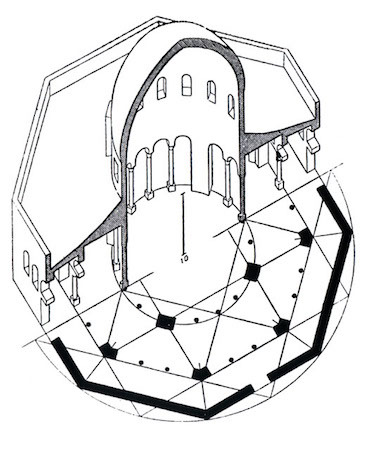 The Rock is enclosed by two ambulatories (in this case the aisles that circle the rock) and an octagonal exterior wall. The central colonnade (row of columns) was composed of four piers and twelve columns supporting a rounded drum that transitions into the two-layered dome more than 20 meters in diameter. The colonnades are clad in marble on their lower registers, and their upper registers are adorned with exceptional mosaics. The ethereal interior atmosphere is a result of light that pours in from grilled windows located in the drum and exterior walls. Golden mosaics depicting jewels shimmer in this glittering light. Byzantine and Sassanian crowns in the midst of vegetal motifs are also visible. The Byzantine Empire stood to the North and to the West of the new Islamic Empire until 1453, when its capital, Constantinople, fell to the Ottoman Turks. To the East, the old Sasanian Empire of Persia imploded under pressure from the Arabs, but nevertheless provided winged crown motifs that can be found in the Dome of the Rock. Wall and ceiling mosaics became very popular in Late Antiquity and adorn many Byzantine churches, including San Vitale in Ravenna and Hagia Sophia in Constantinople. 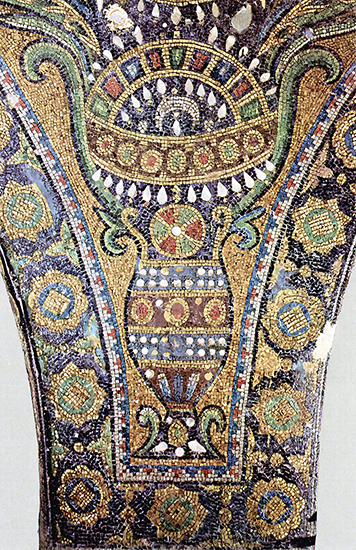 Thus, the use of mosaics reflects an artistic tie to the world of Late Antiquity. Late Antiquity is a period from about 300-800, when the Classical world dissolves and the Medieval period emerges. The mosaics in the Dome of the Rock contain no human figures or animals. While Islam does not prohibit the use of figurative art per se, it seems that in religious buildings, this proscription was upheld. Instead, we see vegetative scrolls and motifs, as well as vessels and winged crowns, which were worn by Sasanian kings. Thus, the iconography of the Dome of the Rock also includes the other major pre-Islamic civilization of the region, the Sasanian Empire, which the Arab armies had defeated. The building enclosing the Rock also seems to take its form from the imperial mausolea (the burial places) of Roman emperors, such as Augustus or Hadrian. Its circular form and Dome also reference the Church of the Holy Sepulcher. The circular Church of the Holy Sepulcher in Jerusalem was built to enclose the tomb of Christ. The Church of the Holy Sepulcher and the Dome of the Rock have domes that are almost identical in size; this suggests that the elevated position of the Dome of the Rock and the comparable size of its dome was a way that Muslims in the late 8th century proclaimed the superiority of their newly formed faith over Christians. The Dome of the Rock also contains an inscription, 240 meters long, that includes some of the earliest surviving examples of verses from the Qur‘an – in an architectural context or otherwise. The bismillah (in the name of God, the merciful and compassionate), the phrase that starts each verse of the Qu’ran, and the shahada, the Islamic confession of faith, which states that there is only one God and Muhammad is his prophet, are also included in the inscription. The inscription also refers to Mary and Christ and proclaim that Christ was not divine but a prophet. Thus the inscription also proclaims some of the core values of the newly formed religion of Islam. Below the Rock is a small chamber, whose purpose is not fully understood even to this day. For those who are fortunate enough to be able to enter the Dome of the Rock, the experience is moving, regardless of one’s faith. Cite this page as: Dr. Elizabeth Macaulay-Lewis, "The Dome of the Rock (Qubbat al-Sakhra)," in Smarthistory, August 8, 2015, accessed April 19, 2019, https://smarthistory.org/the-dome-of-the-rock-qubbat-al-sakhra/.